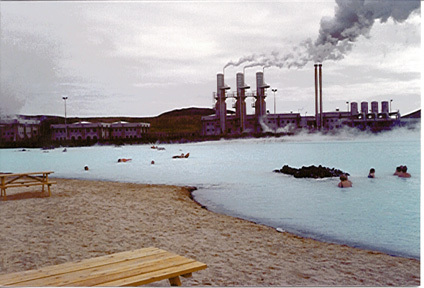 This is a picture of the Blue Lagoon. It is a man made lagoon which is created from the run off of hot geothermal water which is used to generate clean and cheap electricity. The lagoon is well known in Europe and many visitors come every year. It is said that the high sulfur and mineral content of the lagoon cures or greatly helps skin disorders. All I know for sure is its a great place to go on a cold day.